Capt. Henry Skillman - Skillman Family Association Inc.
SKILLMAN, HENRY (ca. 1814–1864). Military scout, pioneer mail carrier, and stage driver, was born in New Jersey in late 1813 or early 1814, according to the El Paso County census of 1860. He probably grew up in Kentucky and came west in his twenties. He first appears in written accounts as a courier on the old Santa Fe Trail in 1842, and he later drove the Santa Fe-to-Chihuahua route as a trader. When the Mexican War broke out, Skillman served as wagonmaster in the Doniphan expedition into Mexico in 1846–47, and at the battle of Sacramento in 1847 he distinguished himself as Captain of Company B, the Traders Battalion. Later that year he was interpreter and guide for American troops in Mexico. Upon Skillman’s return to Santa Fe, he was chosen by Col. Sterling Price to command a party of scouts that traveled from El Paso toward Chihuahua ahead of the American forces. In 1849 and 1850, Skillman was among the first horseback mail carriers between San Antonio and El Paso. In 1851, the United States postmaster general awarded him the first contract for mail delivery between Santa Fe and San Antonio. He ran the route bimonthly until March 1852, when it became a monthly run. That first run was made with six mules and a Concord coach and was accompanied by eighteen well-armed mounted men, but as time went on the route utilized freight wagons, often accompanied by horsemen leading pack mules. Although there was little call for passenger service initially, the postmaster general began to insist that the service be offered on a regular basis. Skillman could not afford to build and provision the stage stations required for such service. Evidence indicates that he tried to maintain his contract under the new orders, for he had an announcement printed (dated December 6, 1851, but not published until September 1852) offering bimonthly passenger service on the Santa Fe-San Antonio route. Passengers could endure a nineteen-day j ourney in makeshift canvas-topped farm wagons for twenty-five dollars. But improvements were too little and too late, and in 1854 the postmaster general awarded Skillman’s contract to David Wasson. Skillman was residing in Concordia at that time and continued to drive the route occasionally for Wasson. His name appears only sporadically in the logs until the late summer of 1857, when he is recorded as the supervisor of the first coach mail delivery route from San Antonio to San Diego, California. Henry Skillman is remembered as the driver of the first west-bound Butterfield Overland Mail stage, which arrived in El Paso on Thursday, September 30, 1858. Skillman took over the reins of the stage at the Horsehead Crossing station on Sunday morning and arrived in El Paso before dawn on Thursday, having spent ninety-six hours at his position, with no rest or relief. When the Civil War erupted, Skillman ran espionage for the Confederate forces between old El Paso del Norte and San Antonio. After several successful trips he was tracked and killed on April 15, 1864, at Spencer’s Ranch, near Presidio, by a detachment from Company A, First California Cavalry, led by Albert H. French. Nestled in the high in the Davis Mountains of Texas is a beautiful little grove of trees called “Skillman’s Grove”. Folklore of the area shed light on the historic site, describing the acclivities of a great, blonde frontiersman from Kentucky named Henry Skillman. So famous are the deeds of this legend that a Texas State Historical Marker was secured and erected in Presidio County to honor him. This marker is located at the entrance of the St Francis Plaza located in the downtown area of the city of Presidio. The Marker reads “renowned southwestern mail and stagecoach man. Born in Kentucky, came to Texas before 1846. Served as a U.S. Army scout in Mexican War. About 1851 established the first mail service from San Antonio to El Paso. When the first Butterfield Overland Stagecoach in 1858 made bid to establish fast service to the West Coast, was selected to drive perilous Comanche Indian area from Horsehead Crossing on the Pecos to El Paso. Made it in four days without rest or relief, his 6-foot frame draped with revolvers and Bowie knives. A Confederate scout in the Civil War. From July 1862, when Federals seized El Paso and the Davis Mountains(to make the longest enemy occupation in Texas), served as liaison between regular Confederate troops and the C. S. A. patriots who plotted in their refugee colony in Juarez to recapture West Texas. Knowing country well, came and went at will. Spread false rumors of Confederates massing in deserts, to divert Federal troops from combat. Came to be most dreaded scout known to the occupation. Was hunted by special force commissioned to take him alive. In showdown at Spencer’s Ranch here on April 3, 1864, fought to his death.” The marker was erected in 1964. There is much more to be told of this brave man of the desert than is reflected in the marker inscription. Early information relates that Skillman was born in 1814 in Jew Jersey–moving to Kentucky with his family at an early age. Early trade records and diaries relate that Skillman arrived as early as 1842 in Texas, with the teamsters traversing the long, dangerous Santa Fe Trail to the Chihuahua Trail. During the course of these activities, Skillman served as a wagonmaster in the Doniphan expedition into Mexico in 1846-47, distinguishing himself in the Battle of Sacramento. He also served as a guide and interpreter for travelers and troops going into Mexico. Skillman and friends organized a subscription mail service from El Paso to San Antonio which led to him being awarded a U. S. Mail contract. This costly and dangerous route could not continue long due to the harshness of the country and the constant Indian attacks. When the Butterfield Overland Mail began, Skillman was also involved as a driver for this service. He was well respected for his knowledge of the Far West Texas area and his ability to communicate with man and animal to get the job done–whatever that might be. Numerous are the stories of Skillman exploits — even his drinking bouts and trips across the border. In the 1860 Census of Texas Skillman was recorded as living at Concordia (near present day El Paso). Skillman was loyal to the Confederacy during the War Between the States. He was a well-known spy and courier for the patriots and forces in the far reaches of West Texas and into Mexico. When the Union Army Forces reoccupied Ft. Bliss and the old Franklin area, they were very unhappy to say the least with the activities of Skillman who often started stories about Confederate invasion. This came to a deadly conclusion on April 3, 1864 when the Union officer Captain Albert H. French and his forces located Skillman and his Confederates on Spencer Ranch near Presidio. During a midnight raid on the Confederate Camp, Skillman and other Confederates were killed. 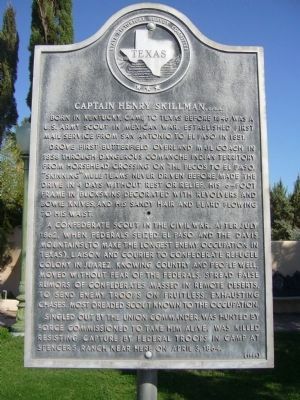 The legend of Henry Skillman is alive and well in the Far West Texas counties where Skillman traveled and made history.